“There’s a line around the block,” my roommate texted me yesterday, referencing the sheer quantity of people in my Brooklyn neighborhood who were trying to sell their unwanted clothes at Buffalo Exchange. Later that day, I saw someone tweet that the expected wait for those in line was estimated to be an hour. This mass desire to get rid of the old falls in line with a generally evergreen new year’s attitude. But this year, there was an element that made the effects all the more extreme: we were all Kondo-ing. On January 1, Netflix released the eight-episode Tidying Up With Marie Kondo, a reality show in which Marie Kondo (the Japanese tidying expert of New York Times bestseller The Life-Changing Magic of Tidying Up). Originally published in 2012, the book details Kondo’s method of cleaning house by getting rid of items that fail to “spark joy.” She also shares her methods for folding clothes, organizing drawers, and generally, keeping tidy. In the show, it all comes to life. Though the KonMari method has been embraced by some for nearly seven years now, Netflix’s new series has launched a brand-new mania. If, this past weekend, you saw a number of Instagram stories of beds piled high with clothes, this is precisely why. If you now feel a need to make your closet look picture-perfect, this is precisely why. Kondo’s approach to tidying looks at all aspects of the home, but her method for decluttering wardrobes seems to be the one that struck the deepest chord with audiences, if lines at re-sell establishments are any measure. 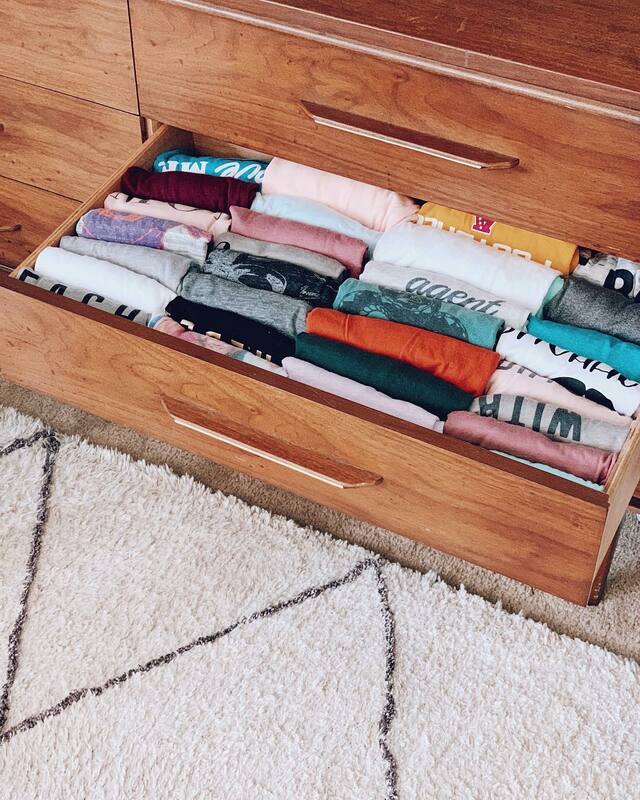 A new trend on Instagram, involving overhead photos of ultra-neat drawers, filled with perfectly folded garments, is also an indication of Kondo’s power. Of all the possible social media trends to start the new year, this is one that we can get behind: it gives us the inspiration we need to declutter our own homes, and, of course, has an oddly satisfying appeal. These Instagrams have sparked some serious joy for us—perhaps they’ll give you the lift you need, too. The ability to see every single t-shirt in your drawer: priceless. Never underestimate the power of a clear bin for overflow. Who can resist arranging clothes in a smile-inducing rainbow? Closet envy is real, and this photo is enough to induce it. If your t-shirts vaguely resemble a neat stack of CDs, you’re folding the right way. Try folding with the KonMari method, and you might discover you have more drawer space than you realized. Do you hear that? It’s the sound of your clothes breathing a sigh of relief. If you want to take your organization even further, arrange your shirts by pattern and color.